Use the word "BOO" on your project. 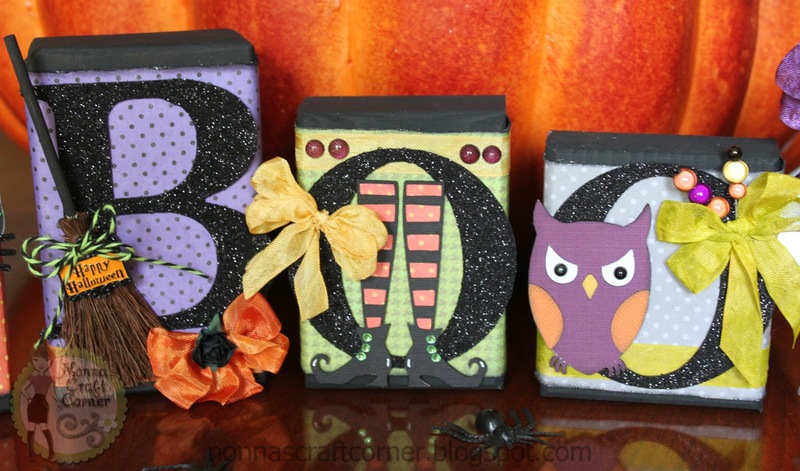 * I started with some plain, unfinished wooden blocks that I ordered from "Oh My Crafts" and painted them with black acrylic paint. The blocks vary in height from about 3.5 to 4.24 inches. * Next, I chose some fun Halloween prints and cut them about an inch shorter than each block. I distressed the edges and inked them up with black ink. Then, I wrapped and glued the strip around each block. * Now comes the fun part of decorating each block! 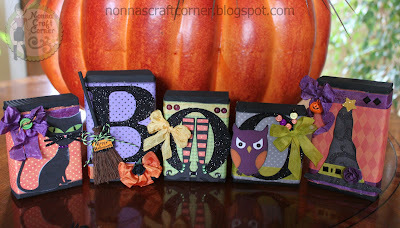 Using the Cricut cartridge "Kate's ABCs", I cut the letters for "BOO". The B is cut at 3.75 inches and the O's are cut at 3.25 inches. I cut each letter 3 times and glued all the layers together for durability. Then I ran each letter through my Xyron and covered them with some Martha Stewart "Onyx" glitter. * The cute little cat is from the Silhouette Online Store. I inked up a few edges with some white ink to add a bit of dimension. His whiskers got a sprinkle of black glitter and his eyes are covered with Glossy Accents. I used some pretty purple Crinkle ribbon on this block and a fun button tied off with twine. A purple gem collar gives this Kitty a sense of style! * The letter B block gets some bright orange Crinkle ribbon with a black rose in the center. I found that fun broom at Hobby Lobby and added a sweet Halloween charm tied on with a "Trendy Twine" twine bow. * The first letter O gets some yellow Crinkle ribbon and that adorable pair of Witches legs! The legs are from the Silhouette Store and get dressed up with some green gems for buttons. I added a few purple gems to the ribbon and a big bow to the letter O. * The grumpy looking owl is also from the Silhouette Online Store. His block is decked out with some lime green Crinkle ribbon and a couple of stick pins that I put together. 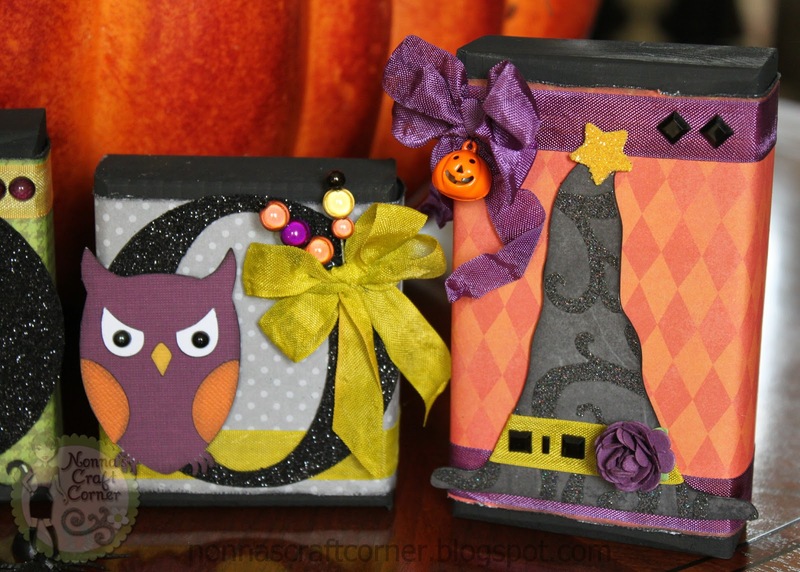 * The last block gets a couple of strips of purple Crinkle ribbon and a fun Witches hat from the Silhouette Online Store. I added ribbon, gems and a purple flower for a snazzy hat band. The bow is accented with a cute pumpkin jingle bell. Well, that's about wraps it up for me. I hope you will drop by to see all the wonderful projects created by Design Team over at the Pause Dream Enjoy Challenges Blog, they have some great things in store for you! 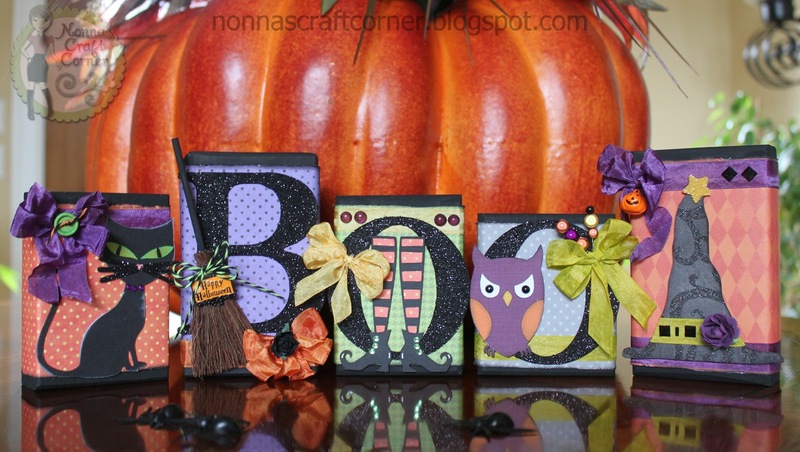 After your visit, go get creative and link up your "BOO" project with us! I look forward to seeing what you have created! WOW! This Looks Amazing. Beautiful Work. Love it! I love glitter and purple so this is just my kind of project. You did amazing. Happy to be on the PDEC DT with you. OMG these are AWESOME!!!! I love the colors and all the details! Simply amazing!!! Love, love, love your altered blocks! I love the bright, bold colors you used. 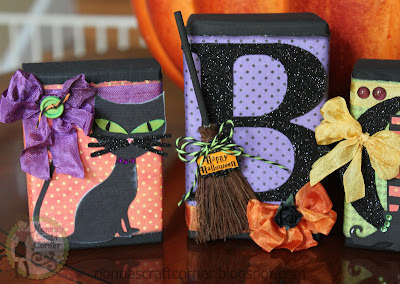 All the accents used - cat, witch's legs, witch's hat, owl, broom - perfect! Oh my gosh, these are so fun Tanya!!! You brought these blocks to life:) These are so festive and look awesome displayed like that! WOW...these are so AWESOME! I love the details and papers! I just love your project. It's so cool with all the colors and embellishments. That little broom is over the top cute. We are getting a Hobby Lobby here soon and now I can't wait. TFS!! Love your Boo blocks. Great colors, papers and cute. Especially that cute owl. Boo! Did I scared you? lol This is an awesome project for Halloween. Its such a delight to see something so creative and was thought out well. Kudos to you, Tanya! WOW! !The complete line up is absolutely AMAZING!! !FABULOUS and FUN!!!!Awesome!! What a great job! Love your take on the challenge. You did such an incredible job!!! :) I love your cute blocks! love the blocks super cute. Awesome job on your blocks, they are too cute! WOW, loving these wood block. Great paper and image choices. WOW...you are so darn talented!!! This is an amazing project...LOVE that broom!!! So fun & colorful, love everything you did! Thanks for linking up with the Trendy Twine challenge this month! Awesome blocks! I just made a set with my nephews name. Thanks for joining us over at Trendy Twine for the challenge. What a grest project! Thanks for sharing it with us at Trendy Twine! Back Again. Seriously love this Home Decor. Thank you for playing along with us over at Trendy Twine. Wow, what an amazing project! I am a huge fan of your creations and this one is no exception. Thanks for joining our monthly challenge over at Trendy Twine! ♥ this! Thanks for playing along in the challenge with us! So many great details. A terrific project. Thanks for playing the Trendy Twine challenge! !